The Bedford/St. 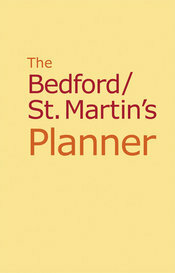 Martin’s Planner includes everything that students need to plan and use their time effectively, with advice on preparing schedules and to-do lists plus blank schedules and calendars (monthly and weekly). The planner fits easily into a backpack or purse, so students can take it everywhere. Free when packaged with the print text.